A group of coal miners listens to speakers at a pro-coal rally, Tuesday, Nov. 28, 2017, at the state Capitol in Charleston, W.Va.
Last month the Trump administration’s Environmental Protection Agency Administrator Scott Pruitt chose an eastern Kentucky mining town as the venue to announce his intent to repeal the Clean Power Plan, an Obama-era rule that sought to limit greenhouse gas emissions. 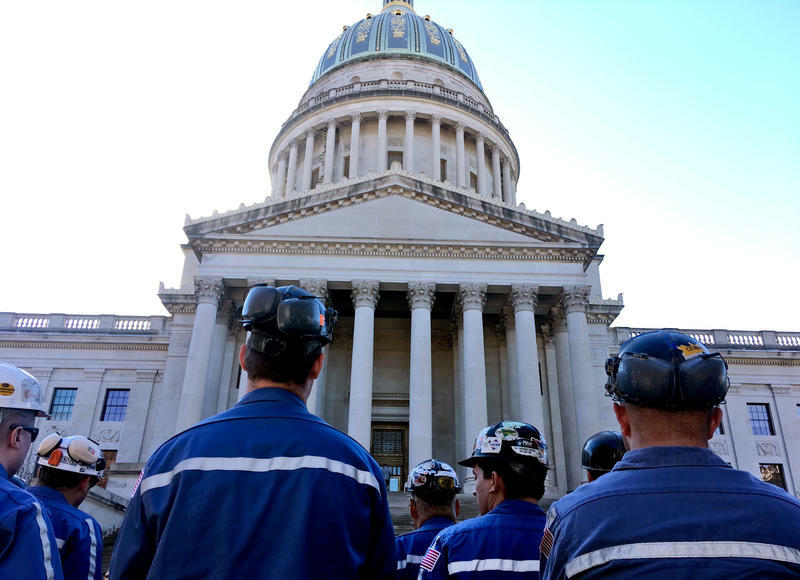 On Tuesday the agency returned to coal country to conduct its only public hearing on the matter in Charleston, West Virginia. Nearly 300 people signed up to comment during the two days of hearings in the state capitol. A number of grassroots environment and public health organizations spoke against the repeal, while friends of coal rallied. A group of about 30 coal miners in work apparel complete with hardhats sat in one of the three hearing rooms to hear their boss, Bob Murray. Murray is CEO of the Ohio-based coal company Murray Energy, and a leading opponent of the Clean Power Plan. He applauded EPA’s decision to repeal the regulation. West Virginia state officials and coal industry representatives from around the Ohio Valley also spoke in support of the repeal, calling the Clean Power Plan an illegal overreach that would cost the region jobs. But the majority of speakers were from small organizations who spoke against the repeal. Many emphasized the health benefits that would come from reducing power plant pollution. Danielle Walker from West Virginia represented the Mom’s Clean Air Force. The U.S. Supreme Court blocked implementation of the Clean Power Plan after a challenge from West Virginia and other energy producing states. The EPA is collecting comments on the repeal of the Clean Power Plan until January 16th.